Near to Venice you will find one of the Veneto's best kept secrets, the little town of Asolo, known as the " city of a hundred horizons." It is quite incredible that so few of the millions of tourists that pass through Venice each year are even aware of this little gem on their doorstep. Don't make that mistake, if you visit Venice take a day trip, better still stay a night or two here and explore the town and the lovely surrounding countryside. The Albergo Al Sole without a doubt. There are a few other hotels in the town but they either don't compare or are out of town. Let's face it if you are coming here to visit the town it makes absolutely no sense to go and stay a few miles outside of it and the Albergo Al Sole is right in the town's medieval piazza. Come here mainly for the joy of being a part of life in this picturesque medieval town - even if it is only for a short while. 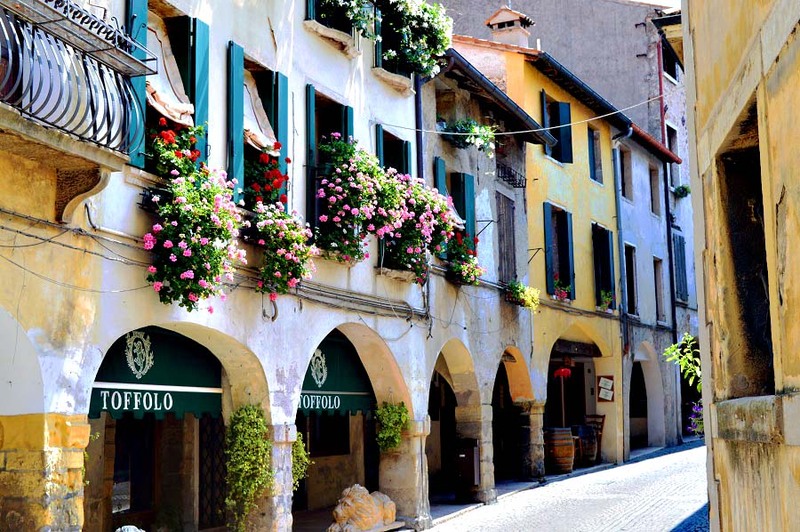 Stroll the streets and piazza's, browsing the many shops full to the brim with home made products and selling some absolutely amazing food, ranging from the local bread made on wood fired ovens to some of the best salami you will ever eat. Perhaps you can't survive on the pleasures of life in a charming little old Italian town alone and need some historic sites to get you going? If so you needn't despair - there are a few very good ones. The main sights are undoubtedly the 13th castle of Queen Cornaro which is now a theatre, the 9th century tower high above the town and the old city walls on the hill as you walk up to the tower. A few others of note include the cathedral, which dates back in parts to the 10th century, and the 16th century villas on the edge of town. If you are interested in antiques then visit the antiques fair which is held on every second Sunday of the month and attracts people from far and wide. Even if you don’t normally care much for antiques I can assure you that there is plenty to keep you interested in this very unique market. By car is easiest but if you don’t have a car then you can catch the train from Venice to Treviso and then the bus from Treviso to Asolo. The train to Treviso from Venice runs every twenty minutes or so and takes about thirty minutes. The bus from Treviso will take about the same time. If you can't be bothered with trying to figure out Italian public transport I would suggest taking this excellent tour of Asolo from Venice. For more on Asolo click here.